Nice story, Kellianne! 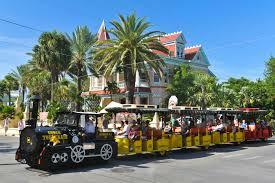 Key West is one of our favorite places. In fact we got married there on one of the tall-ships. It sounds like you might have been visiting from a cruise ship. I hope you got to spend some time there. It’s a great town. Very brave to leap off the Conch Train! Thanks Stephen! Yes, it is breathlessly beautiful in Key West. Hope you get back there soon! Never a full moment with you! Glad you got it back! You should have asked the man to share the video with you! Lol!